The Frequency Electronics Inc FE-5650A and FE-5680A Rubidium references are natty little units small enough to hold in your hand, and yet not only contain a high stability Rubidium Frequency Standard, they also potentially contain a 0 to 20 MHz Direct Digital Synthesizer! One of these units can serve as a useful shack reference, and because it can be remote controlled to any frequency within its operating range, it also makes the framework of an excellent synthesized signal generator with impeccable accuracy and stability. With the right software (see below) it can even become a useful QRP LF/MF/HF Exciter as well. This project specifically addresses the Opt 58 version of these products, which generate only a 1pps (one pulse per second) reference (no HF sine wave output), and so have little use for other applications without modification. This also means that the units are available from internet sources at attractive prices. Originally intended for telecoms applications, the FE-5650A Opt 58 unit has been available for some years through the surplus market. The equivalent FE-5680A version is in a more convenient package, and is of more recent manufacture. The opt 58 versions (the most widely available) do not have the RF connectors shown in the pictures above, and this is what uniquely identifies them. The FE-5650A Opt 58 has only a tiny PCB connector (not the one in the photo), and the FE-5680a a DB9M type as shown, but no BNC connector. Internally the 5650A and 5680A models are almost identical, just packaged differently. The main difference is in power supply requirements. The unit has a peaked filter at the synthesizer output, and so the level at other frequencies varies wildly. This can be corrected with minor modifications. When operating at any other frequency than 8388.608kHz, the 1pps output is of course incorrect. - but ONLY if the calculations, on which the command sent to it is based, correctly use 32-bit maths. The serial control connections must be brought out to a suitable connector for computer control. Some changes must be made to the internal filters to improve the low frequency response. A new RF output connection must be added. Since the modifications are covered adequately elsewhere (see links below), they will not be covered here. Unfortunately there is no schematic available for these units, so the modifications have been devised through guesswork, native cunning, and an understanding of the Analog Devices DDS chip. Note: The calculations must use high precision - all decimal places of REFERENCE and RESOLUTION values must be used in calculations, or the results will be inaccurate. The Windows™ calculator is capable of these calculations in scientific mode. In order to stay within the 32-bit capability of the calculator, always perform the calculations in two steps, and always divide before multiplying. For example, to determine a value for COMMAND, don't multiply REQUIRED_OPERATING_FREQUENCY by 232 and then divide by REFERENCE, as this combined calculation requires a 64-bit calculator! The command S<CR> invokes a response giving the calibrated ~50MHz reference frequency from the physics package (clock reference to the DDS), and the operating frequency specified as a 32-bit HEX number. The actual operating frequency can be determined by converting this HEX number to decimal, multiplying it by the ~50Mhz frequency given, and dividing the result by 232. The purpose of the last eight hex characters is unknown, and they are always zero. will set the frequency to 8388608Hz. The step resolution is exactly the ~50MHz frequency divided by 232, or about 0.01Hz. This command stores the default (power-up) operating frequency. The command E<CR> causes the current frequency to be stored for use at power-up. There is no response from the unit. It's probably not a good idea to play with this command too often, as it writes to EEPROM which may have a limited write life. In addition, changing this value affects calibration, necessitating a change to the RUBY4 software setup; when using the unit with a PC and self-calibrating RUBY4 software, there is of course no need for continued use of the 'E' command for calibration. Note: Other than by trimming the 'C-Field' pot inside the unit, there's no way to ensure that the unit is closer to the requested frequency than half the resolution (~0.005Hz). If you do trim the C-Field pot, it will however only hold good for the one frequency. This behavour is quite unlike that of a PLL synthesizer. No commercial software is known to exist for this unit. 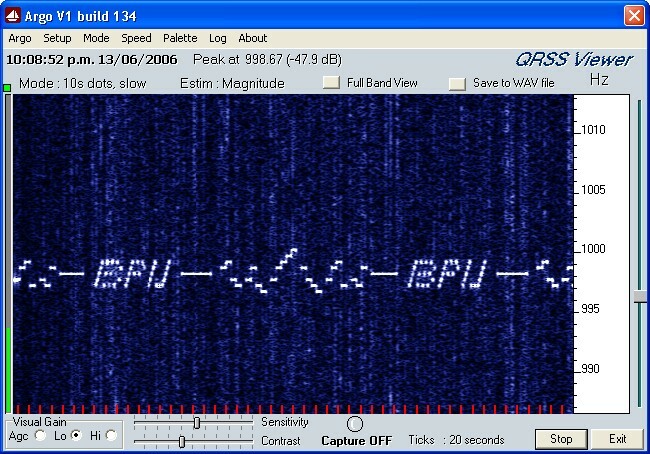 Two programs are currently available from ZL1BPU. The programs are essentially similar, in that they set the FE-5650A/FE-5680A operating frequency to within ±0.005 Hz using 32-bit maths, and also allow the output to be turned off (well, set to an impossibly low frequency!). One program also allows the unit to operate as a slow-speed beacon or stepped generator, generating any pattern of up to 16 equally spaced frequencies, at any rate from 1Hz downwards in 1Hz steps. This is a text-mode DOS executable program which should operate in a DOS box with every flavour of Windows™. - Enter the operating frequency in Hz (to two decimal places) and press ENTER. The synthesizer will go where you send it within about 200ms. - If you preface the command with '#', and use exactly valid eight HEX characters, it will also recognise native DDS frequency values. - Enter '0' as the frequency to turn the generator output off. - Press ESC to exit the program. The last value is usually (but need not be) the one given by the S STATUS command. If you change the default frequency or recalibrate the unit, these values change. The software uses these values to work out the frequency resolution, and thus calculate your frequency commands accurately. RUBY4 is available for free download from the links on this page. This is also a text-mode DOS executable program which should operate in a DOS box with every flavour of Windows™, and has similar appearance and commands to RUBY4. It also uses the same setup file. However, this program also has a built-in beacon and pattern generator! It allows the unit to be operated as a simple sweep generator or as an LF/MF/HF Exciter, for example to use for test transmissions or as a beacon. - The pattern - a single line of HEX character commands specifying which frequency is sent in each interval. The frequencies are generated sequentially, one at a time, and are created with phase coherence for minimum keying noise. The nominal frequency (see later) is that specified in the last frequency command, while other frequencies are this value plus the separation times the value of the character in the script - 8, 0-9 and A-F. In otherwords a value of 8 generates the nominal frequency. The script pattern can be any length up to 256 characters, which must be on one line. Just about any Morse, carrier, text or graphics image can be created. Invalid characters are ignored, so you can place spaces in the script to make it easy to follow. Since subsequent lines in the script are not read, you can also add a text comment. Once the end of the pattern is reached, the pattern starts again with no delay. 'n' is a duration multiplier for frequency elements, allowing the speed to be changed during the message. also be stretched by simply repeating them - there will be no glitches. Exits the pattern after one iteration (can only be the last character in the script, as all following are ignored). since the generator starts and stops instantaneously, although the results are fairly good! The RUBYP2 software is not free. The usual charges apply. See Project TF.5. The program comes with example scripts. Copyright © Murray Greenman 1997-2009. All rights reserved. Contact the author before using any of this material.